After a successful brush with faux gras, dinner earlier this week was to feature fillet steak. Fried in butter! Cooking doesn’t get any more desirable than this! A propos of nothing other than three friends getting together for a meal, I decided it was time to tackle one of the magnums that prove irresistible to buy, but somehow never quite appropriate to open. 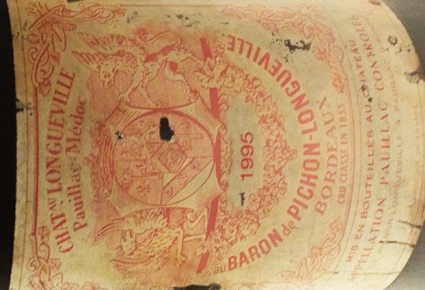 I’ve had this particular bottle since purchasing it En Primeur, which allowed me to forget about any value it might have, and just enjoy it for what it is. Besides, the label had got somewhat ruined in a damp cellar (which of course means ideal storage for the contents) - its lovely bronze foil lettering having decayed to a sort of slightly rash-like red under-print. The magnum had been standing up for a while. This is very important. Although bottles should be stored on their side to keep the corks damp long-term, prior to opening they should be stood upright for as long as possible to allow the sediment to fall to the bottom, and ideally to stick together, which means that you will be drinking a clear wine. You simply cannot get the finest, most grainy, sediment out of a wine with anything other than gravity and it will be weeks, months even, before a cork dries out and causes damage. Well, the wine was magnificent. A classic vintage of a top property, it had all the hallmarks of maturity, but at 19 years old it still had plenty of fruit. This is just the age at which I like fine red wine. Too old, and the fruit is lost to be wholly supplanted by the furniture polish and beeswax patina of age and possibly with meaty, mushroomy characters. The latter can work as part of a marriage of flavours, but on their own, always to me feel as though a wine has been kept just too long. However, when too young, red wines from Bordeaux, especially at this level, have all the backbone of Cabernet Sauvignon tannins which can be so searing as to mask the balance, flavour and quality of the wine. And your tooth enamel. Tasting En Primeur samples from the barrel is something that you do only once – if fun is your objective anyway. 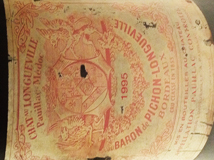 This Pichon Baron has hit its plateau of excellence (it might be slower developing from a magnum than a bottle of course). 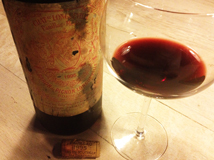 There was plentiful red and black fruit, but underscored by layer upon layer of the magic of old wine – varnish, candle wax, dried spices, leather and musk. The oak had left behind its imprint of cedar and tobacco, but lost the flush of sweet vanilla it would have had when young. It went perfectly with the beef, and suddenly a magnum wasn’t quite enough between three of us. One of those great wine experiences well worth recording.